Dramatically ringed by the Balkan mountains to the north and the Vitosha mountains to the south, this former Ottoman stronghold offers the visitor everything from thermal springs and tree-lined boulevards to street bazaars and a vast array of architectural styles. Favorite attraction: Sofialand for children and adults. Favorite shops: Vitosha street – lots of expensive stores. 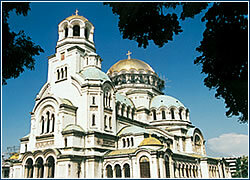 Advice: Visit Vitosha mountain range and the Russian cathedral “Alexander Nevski”. Advice: Don’t use your credit card outside of the hotel, pay cash. This is a luxury hotel located in an attractive part of the city, in Dragalevec, next to the Vitosha mountains. Newly opened luxury restaurant offering seafood specialities. Some meals are prepared directly in front of costumers. This restaurant is well-known throughout the country. Fantastic night club with live Latin-American music. The show is presented by popular Bulgarian actors and singers. 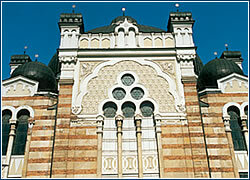 Favorite attractions: The biggest attraction of Sophia and all the Balkan peninsula is Sofialand. 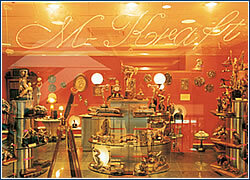 It is fashioned after Disneyland in the US or the Pratter in Vienna. Best-kept secret: Pristine areas in the Vitosha mountain range with splendid vistas over the Bulgarian capital. Favorite shops: The ideal place for shopping is Boulevard Vitosha, where you can find luxury (but not too expensive) stores selling basically everything. http://www.virtualtourist.com/vt/5ca44/ -a strong focus on accommodation, but also info and an interesting discussion forum for insider’s views. 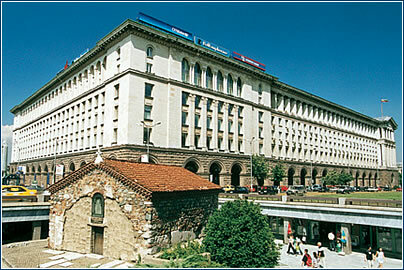 · Bulgaria is among one of the most industrialized former Eastern Bloc countries. The main industries based in Sofia are machinery, including farm machinery and car assembly, as well as textiles and food products. The city was also the center of former Soviet Bloc high-tech industry and excels in electronics, particularly computers, software development and the creation of some very nasty viruses – due to a cadre of young tech-heads with too much free time. · Bulgaria is working hard to align its laws with European Union standards, in the hope of gaining EU membership, although this looks a long way off. The Bulgarian government is keen to attract foreign investors and has passed new laws to protect and assist foreign businesses, attracted primarily by a highly qualified, computer literate and cheap labor force. 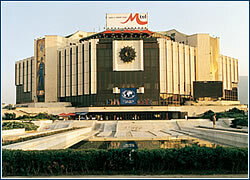 The main business districts in Sofia are located on Vitosha Boulevard and in the Sveta Nedelya area. · Bulgarian business people are reserved and often highly suspicious of an outsider’s intentions until the proper introductions and contacts have been established. Business visitors should request meetings well in advance – in writing or by fax – and arm themselves with documents detailing interest and position. People in the higher ranks are likely to be former Communist party members and thus stiff officiousness should be prepared for. · Bulgarians pride themselves on their IT development, and visitors will be expected to scrutinize the company’s website before questions are entertained. Dress code is standard suit and tie for men, while women are allowed to dress more daringly – short skirts and plunged necklines are not uncommon. English is generally well understood, although it is important for visitors to note that nodding the head means “no”, while shaking the head means “yes”. · Standard office hours are 09:00-18:00. Arrangements should be kept and punctuality is important. Bureaucracy tends to be slow and complicated, so patience is essential. However, Bulgarian after-hours socializing is lively indeed, with a prodigious intake of food and alcohol – foreigners are advised not to attempt to keep up.